The Simpson Street Free Press interns for the Dane County Land and Water Resources Department recently had the chance to attend a teaching workshop at the UW- Madison Arboretum. It was hosted by the Latino Earth Partnership, an organization that works to promote collaboration between educators and Latino communities. The workshop was very hands on. The facilitators led several environmental-based games and icebreakers to provide examples of engaging activities. For one of the activities, they split us up into small groups and had us create a new name for a wildflower. The names ranged from ridiculous and comical to short and descriptive, and everyone’s creativity and observational skills were put to use. Teaching these activities is just one of the many ways the Latino Earth Partnership works to connect youth with the natural world. Amy Callies is a kindergarten teacher and school forest coordinator at Parks Elementary School and co-leader of the workshop. 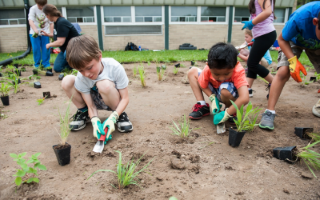 “Taking part in the Earth Partnership provides educators with the tools, support, and inspiration to go back to their schools and facilitate place based, relevant, hands-on projects in their school communities. Students who participate in these real world projects have a better understanding of how all living things are inter-connected which provides for a greater appreciation for the environment as a whole system,” Callies told us in an email. Educators at the workshop were also given the chance to bring these real world projects to the classroom by taking advantage of a Dane County Land and Water Resources Department program that provides free native plants for school and community projects. Aendee, Deborah Crabtree, was one of the recipients of the native plants. She is the STEM Specialty Teacher for the elementary after-school program at the Goodman Community Center, and worked with students to plant 500 native plants on the Goodman Community Center’s property. “Receiving native plants from the Dane County Land and Water Resources Department was such a wonderful experience! The native plant program helped us expand our outdoor science education this year by offering youth in-depth opportunities to explore the outdoors while learning about the environment and the benefits of native plants... Many youth were first-time gardeners and excited to get their hands and faces dirty,” she said. Crabtree believes that these opportunities have a profound effect on youth. “By connecting with nature, it is my hope that youth realize the importance of the effect of human impact on our natural spaces and responsibility to care for our Earth and precious natural resources,” she added.